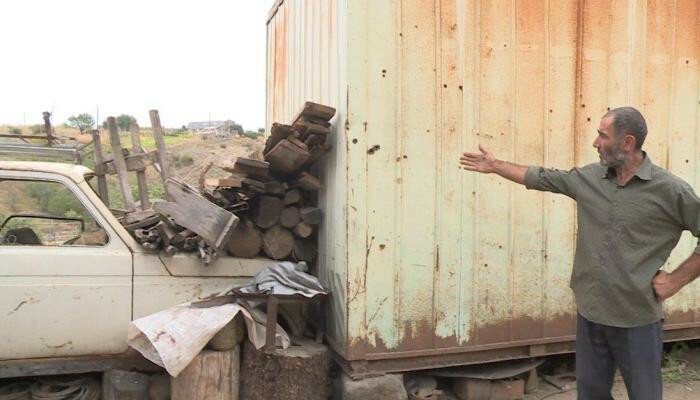 The Bejanyans living in Koti village will get rid of the metal container and the bad memories connected with it by the end of the year. They have many sad memories. The most part of the 55-year-old Babken's life has passed in a metal container. Babken, with his three sons and wife had to endure not only the inconveniences of living in a container, but also the persistent firings of the enemy. Their baby daughter in the crib was miraculously saved from those firings. She left the metal container, his father's ''home'', only after getting married. In the frontier Koti village the constant firings have unfortunately become ordinary. The many holes on the walls of the Bejanyans' metal container were the silent authentication of it. The mother of the family, Nuneh, compensated with the loss of health for the pains and hardships endured in her life. Now, she has a peace of mind for her daughter who lives abroad, though misses her a lot. She wants to see her sons, the 30-year-old Garik and Gurgen, who are almost the same age, next to their father as strong supporters, with their own families, but already under a safe roof. The question of their marriage is not even discussed due to the lack of housing conditions. The main source of income of the Bejanyan family is farming, but being under enemy shootings makes it not only dangerous, but also not profitable. The thoughts of building a home has never left the family father quiet, however, he wasn't able to solve the housing problem even partially. His only dream is to have a stone built house. ''The most of my life has passed... I did not have a good sleep... I don't want my sons to go through the same hardships, I don't want my sons to think only of the problems and leaving the country, when they get married, instead, I want them to think of having children and making the village prosperous. Don't know why, but I think for once life will be good to us,'' said Babken, the family father. VivaCell-MTS and Fuller Center for Housing Armenia, partnering through housing projects over 10 years, expressed readiness to assist the Bejanyan family. The partnering sides have taken steps to make the Bejanyan family dream come true by the end of the year.